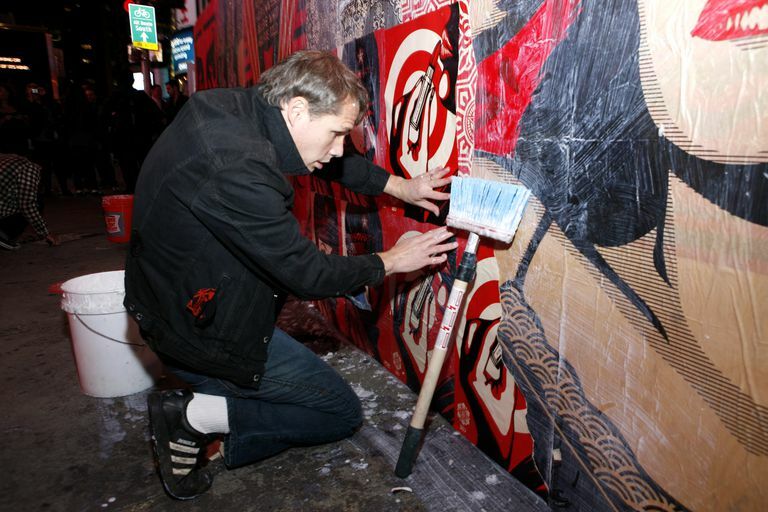 Often described as a Street artist, Shepard Fairey's name first began to appear in the news for wheat pasting (a method of adorning public spaces with the artist's own posters by way of a water and wheat mixture—like a wallpaper paste), sticker tagging, and the numerous accompanying arrests that now comprise his official criminal record. He's best known for his painting of Obama in 2008 titled Hope and his poster from 1992 titled Obey, which inspired a clothing line of the same name. "I think the Obey icon image finds a balance between goofy and creepy, humorous and monolithic. I consider the image the counter-culture Big Brother. I'd like to think of it as a sign or symbol that people are watching Big Brother as well. 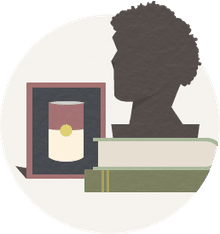 I've had people ranging from anarchists to the president of the National Reserve Bank embrace my work and I think the more diverse the audience is, the more potential for interesting dialogue there is." Shepard Fairey was Frank Shepard Fairey born on February 15, 1970, in Charleston, South Carolina. The son of a physician, Shepard Fairey fell in love with making art at age 14. After graduating from the prestigious Idyllwild School of Music and the Arts in Idyllwild, California in 1988, he was accepted at the Rhode Island School of Design. (If you're not familiar with this fine institution, RISD is almost ridiculously hard to get into and enjoys a sterling reputation as a training ground for working artists.) Fairey graduated in 1992 with a B.F.A. in Illustration. While attending RISD, Fairey had a part-time job in a Providence skateboarding shop. The marginalized, "underground" culture there (where styles are out as soon as they're in) synthesized with that rarified art school culture and Fairey's ongoing interests in punk music and stenciling his own punk music t-shirts. Everything meshed on the day a friend asked him how to create a stencil. Fairey demonstrated with a newspaper ad for a professional wrestling match featuring Andre the Giant which was the most banal image he could have grabbed. Tantalizing "what if" possibilities began to cross Fairey's mind. It came to pass that Fairey, who had only recently become aware of Graffiti Art, took his "Obey" stencils and stickers to the streets. Andre the Giant famously gained a posse and Fairey's name was launched. Fairey has often been accused of plagiarizing other artists' work. In some cases, even casual examination of these claims shows almost verbatim copying with little transformation. While some of the older, political propaganda works are in the public domain, others are not. The real issue seems to be that Fairey copyrights these appropriations, enforces his copyrights and profits from them. "There are a lot of different people who’s [sic] work I like that aren't necessarily aesthetic influences, but conceptual—and there are some that are aesthetic. I’m inspired by John VanHammersfeld who did a lot of psychedelic poster graphics and one of my earliest Obey Giant graphics was my knock of his iconic Hendrix graphic. My work is very much a melting pot of a lot of different influences." Fairey also disappointed a segment of his fans by not remaining a cult figure and beginning to make money as an artist. Conversely, his messages calling for social and political change are sincere, he donates heavily to causes and he keeps a staff of assistant artists gainfully employed. Many parallels can be drawn between Fairey's image sources and those of Andy Warhol, who is now celebrated in the art world. Only time will tell if Fairey attains Warholian status, but he gained a lasting place in history for the HOPE poster during Barack Obama's 2008 Presidential campaign. Fairey, Shepard. E Pluribus Venom. Berkeley : Gingko Press, 2008. Fairey, Shepard. Obey: Supply & Demand : The Art of Shepard Fairey. Berkeley : Gingko Press, 2006. New York : Soft Skull Press, 2004. What Makes Damien Hirst Such a Controversial Artist?